I am doing Morocco this week and Miriam said she had seen a recipe for Moroccan corn and stone fruit salad. She really liked my last corn salad and wanted something similar. I was not able to find the recipe she had read, so I did what seemed right to me. Many Moroccan salads call for mint and yogurt as the dressing. I did not think that this would go well with either peaches or corn. To make the dish Moroccan, I decided to season the corn with Ras el Hanout. This “head of the shop” blend is a complex North African mix of spices. Today, instead of making my own, I am using a blend from Whole Spice. Instead of making a separate dressing, I am planning to puree some of the peach. This puree will meld with the spices roasted with the corn to make the dressing. This should make the salad moist and creamy, without adding any disruptive flavors. 1. Shuck the corn and scrub (gently) to remove the corn silk. 2. Crush the garlic and put it in a bowl with the butter. 3. Microwave the butter for 25 seconds. 4. Brush the corn liberally with the garlic butter and sprinkle the corn liberally with the Ras el Hanout. 5. Sprinkle the corn lightly with salt. 6. Grill the corn, turning frequently, for 20 minutes, until the corn is fully cooked and well charred. 7. Let the corn cool slightly and the cut the nibblets from the cobs. Tip: Here is a helpful video from Toni Tanner Scott. 8. Blanch the peaches in a large pot of boiling water for two minutes. Shock the peaches in cold water to stop them from over cooking. Tip: This process makes it easier to peel the fruit. 9. Remove the peach stones and chop the fruit into bite-sized pieces. 10. Put one quarter cup of the peaches into a blender and add yjr lrmon juice. Process the fruit until it is smooth. Tip: The acid in the juice keeps the peaches from browning and add enough liquid that you can blend the peaches..
11. 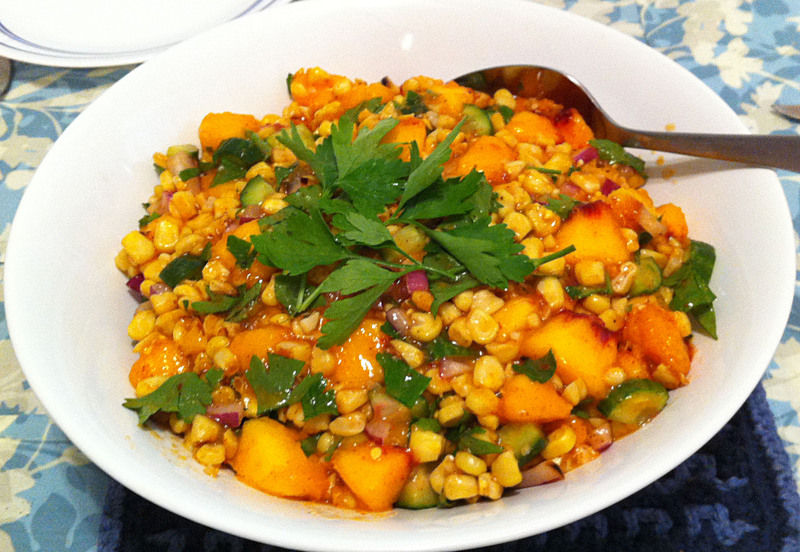 Place the corn, peaches and peach puree, cucumbers, red onion, and parsley in a bowl and toss to mix. 12. Let the salad meld for 20 minutes or more. 13. Toss once more and put the salad into a serving bowl. Garnish with a few leaves of parsley.